Boston Beer Co., brewer of Samuel Adams beers, has begun conducting tastings around the country where consumers can help pick one of the beers that will be sold in the 2008 Brewmaster’s Collection 12-pack. The winning beer will also be sold in six-packs. 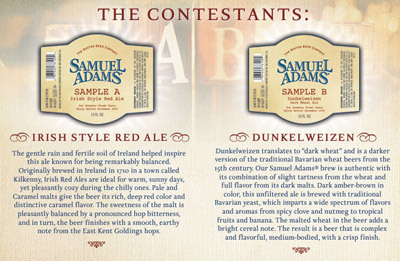 This year’s contenders are a spicy, fruity (particularly banana) Dunkelweizen and rich, caramel-accented Irish Red Ale. In similar contests, a Brown Ale won voting in 2005 while Honey Porter bested a Smoked Lager in 2006. Information about where to find a tasting event is at the Samuel Adams web site. Tasted both of these recently at the Boston Beer Company’s location before a brewery tour. The Red Ale is a full-bodied, flavorful, reddish brew with a thin head and a slightly bitter finish. The Dunkelweizen, which translates to “dark wheat,” is just that – a dark colored wheat brew. It reminded me of Sam’s Black Lager but with a more full-bodied flavor and increased carbonation. Sample ’em and cast your vote before one hits the bottles next year!